Top officials from Tourism Ireland were in Toronto last night (Jan. 30) to introduce travel trade VIPs to the destinations new marketing campaign – Fill Your Heart With Ireland. 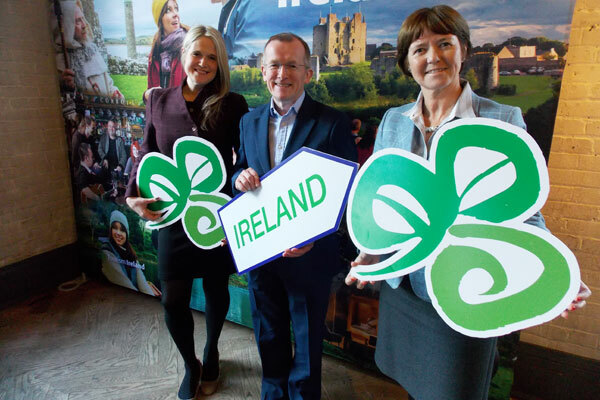 Tourism Ireland’s CEO, Niall Gibbons; vice president North America and Australia, Alison Metcalfe and Canadian manager, Dana Welch explained the strategy of the destination’s launch of its first new advertising campaign in seven years. The trio told the audience of about 60 that the new campaign is all about extending the season and expanding tourism offerings into new regions of Ireland. They also noted that the campaign doesn’t focus on age demographics, rather it targets travellers based on the experiences that they’re looking for in a vacation. If you want to check it out, go to https://www.youtube.com/watch?v=gSeqQ3R8zUY. In other news, Tourism Ireland’s CEO, Niall Gibbons to the gathering that 2018 was a great year for tourism, with the destination welcoming 11.2 million overseas visitors and those visitors spent 6 billion Euros. Gibbons said that Canada continues to turn in strong growth results and overall he was in a positive mood about 2019. Stay tuned, there’s more to come on Ireland in upcoming issue of Canadian Travel Press and Travel Courier. Seen here, from l to r, are Dana Welch, Niall Gibbons and Alison Metcalfe ready to welcome guests at the Toronto briefing on Tourism Ireland’s new Fill Your Heart With Ireland campaign.